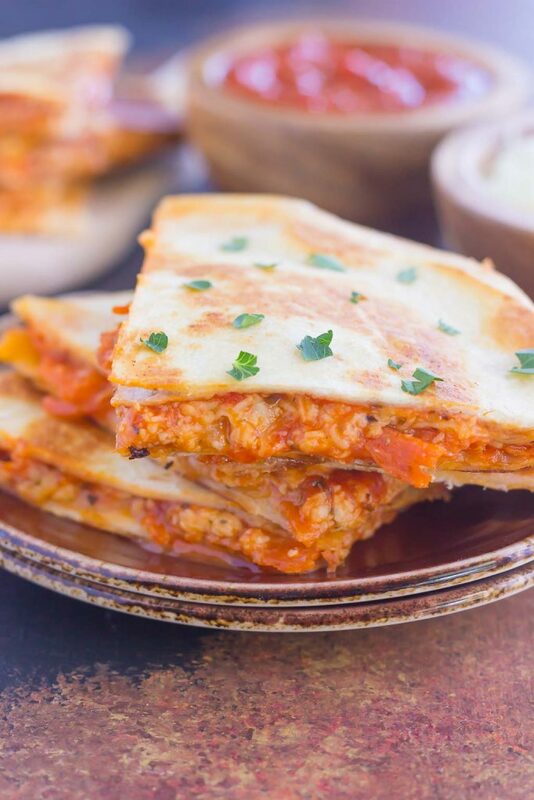 Perfect for a Friday night or anytime that want a quick meal, these Easy Pizza Quesadillas are sure to become a regular on your meal rotation! It’s Friday night, and the moon is bright. Gonna have some fun, show ya how it’s done, TGIF! But enough about TV shows, though I am super excited for the fall season to begin soon! Nashville, Revenge, American Horror Story, and Grey’s Anatomy, please! Anyways, since it’s Friday, and I always have that theme song stuck in my head on these days, I thought I would share with you one of my favorite start-of-the-weekend recipes…Easy Pizza Quesadillas! 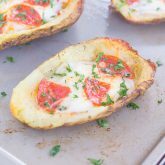 Flour tortilla shells stuffed with pizza sauce, mozzarella cheese, and pepperoni slices will create an easy and delicious appetizer or dinner for the start of your weekend. If you’re anything like me, cooking is not an option on Friday nights. The hubster and I usually go out for dinner or order a pizza. It’s a great ending to the week in my book! 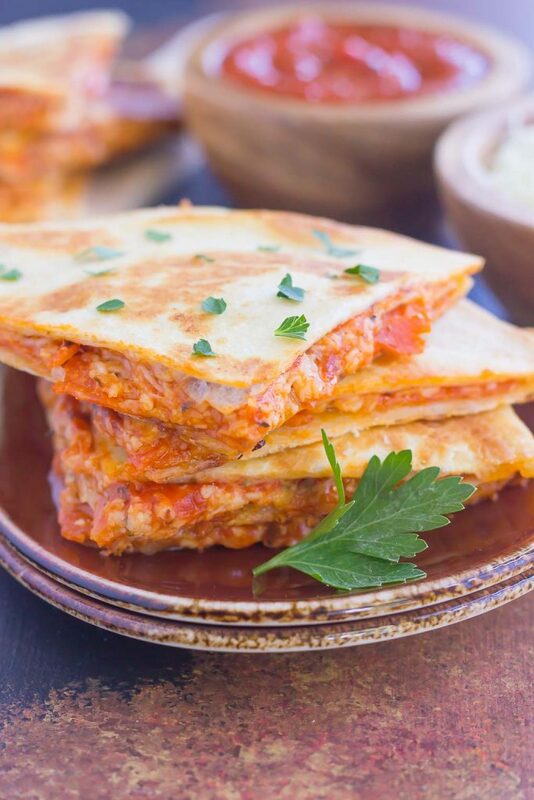 And because pizza is hands down my favorite food (I could eat it 24/7), I decided to put a creative spin on it and make these Easy Pizza Quesadillas. Like most of my recipes, these quesadillas are a breeze to whip! Simply spread a thin layer of pizza sauce onto a flour tortilla, top with mozzarella cheese, pepperoni (or you choice of toppings), and top with a second quesadilla. Brown the tortilla lightly in a skillet coated with butter and that’s it! In a matter of minutes, you will have a hot and tasty quesadilla, oozing with your favorite pizza toppings. 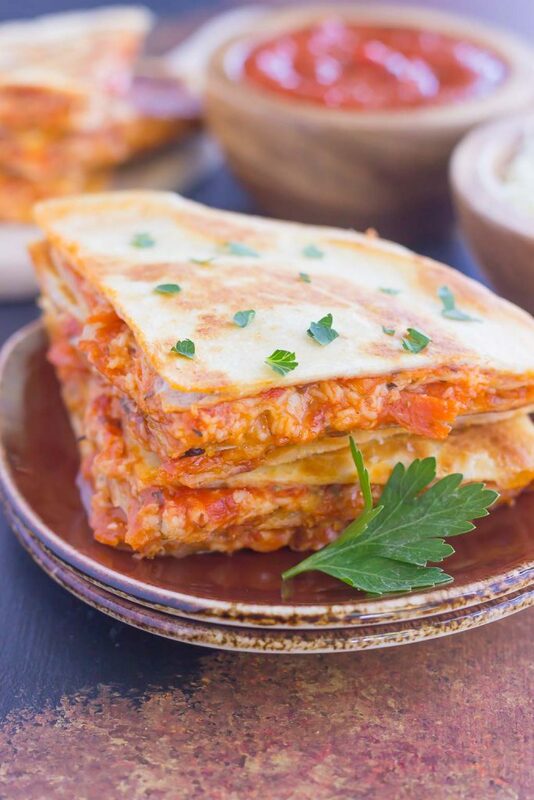 Perfect for a Friday night or anytime that want a quick meal, these Easy Pizza Quesadillas are sure to become a regular on your meal rotation. Looking for more pizza-inspired recipes? I’ve got you covered! In a large skillet, melt butter on medium heat. Place one tortilla on surface. Spread pizza sauce on tortilla in a thin layer, leaving 1/4 inch of space from edge. Top with cheese, pepperoni, Italian seasoning, and garlic powder. Take second tortilla and place on top of pizza. Gently place quesadilla onto buttered skillet. Brown evenly on each side for 3-4 minutes, or until lightly browned. Remove from skillet and onto plate. Cut into triangles and serve with pizza sauce, if desired. Quesadillas are easy to customize based on your preferences. Feel free to swap out the mozzarella cheese for cheddar cheese, use sausage instead of pepperoni, or add in mushrooms, peppers, etc. Quesadillas will keep refrigerated for up to 5 days. OMG. I loved Family Matters. Loved it. And Step by Step was so cheesy and fun! Speaking of cheesy...heh heh. These quesadillas rock. I love them! Perfect for a Friday night crash at home. Those were the best TV shows, right?! Thanks for the kind words, Mir! hummm, I used to watch all of those shows!!... that just means we are showing wisdom though right? not age...? ...anyways I love how easy this is to throw together and I'm such a tortilla shell fan I mean it's a carb lol I love my carbs...have a great weekend Gayle! We're definitely showing wisdom, Michele! I like your thinking! :) And I love my carbs too, along with a little cheese! Have a great weekend, too! Yum! Easy dinner. I'm in. And so are the kids. Have a beautiful weekend! Hooray for easy dinner! So quick to make and definitely kid-friendly! Have a wonderful weekend too, Melanie! I'm a sucker for anything with pizza flavor, Sarah! These quesadillas are so fun and easy to whip up, so I can have pizza anytime! I *love* how easy these are! And, we're huge fans of quesadillas. What a perfect dinner for a Friday night. Yea to no cooking! :-) More time for a little R&R! Thanks, Kristi! This is the perfect meal to whip up when you don't feel like cooking or going out to eat! The nineties were definitely the best TV shows, Bri! Thanks so much for the quesadilla compliments! I get so ridiculously excited about my shows returning! I watch way too much tv. :) Quesadillas are so yummy with their crispy crust and that cheese oozing out. I totally want these with extra pepperoni right now! Ha ha I think I might watch too much TV too, Leah! I love the ooey gooey cheese too and how easy these babies are to throw together! Oh my gosh Gayle, I *totally* remember that song! TFIG on ABC was the best! I loved all those shows, and I still watch Full House and Boy Meets World reruns when they're on. Then Saturday was all about Snick on Nickelodeon. Ha! These pizza quesadillas sound delicious! So much faster to whip together than a homemade pizza. Yum! Yes! I totally forgot about Snick! My brother and I would always watch that on Saturday nights. Thanks so much for the quesadilla love, Natalie! I lived for TGIF!! I remember it so clearly! :) Love this easy dinner idea! Way faster than making homemade pizza for sure! I wish they would bring back TGIF, but then it probably wouldn't be the same! I love making these quesadillas for a quick meal, so delicious! I think we must have been watching that Friday night line up at the same time because I totally remember that song and looking forward to those shows every week! We need something like that these days to enjoy with our kids! I love these pizza quesadillas - so easy and yummy! These quesadillas are definitely kid-approved, Kristine! Thanks for the kind words! Looks yum and so easy to make! I would take out the pepperoni and add veggies in place (since I'm a vegetarian). Will try this out! Sounds like a great idea, Manali! These quesadillas are so versatile depending on your tastes. Hope you enjoy! I wish Friday night shows were still like that! But at least these quesadillas are a quick and tasty dinner! Thanks, Kelly! Thanks, Danielle! 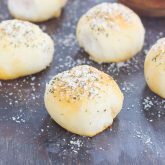 I love anything with pizza flavors, so these are perfect for a quick Friday night meal! Gayle, I just showed this recipe, well the photos, to my husband who loves to make quesadillas, and he's drooling. I guess we'll have them this weekend. These are definitely drool-worthy, Eva! I hope you and your husband love these if you try them! Thanks so much for the kind words, Olivia! Have a great weekend, too! I like that you chose to Italian Seasoning and Garlic Powder, really adds flavor! Thanks, Tracy! I love adding in different seasonings, especially garlic powder, whenever I can! 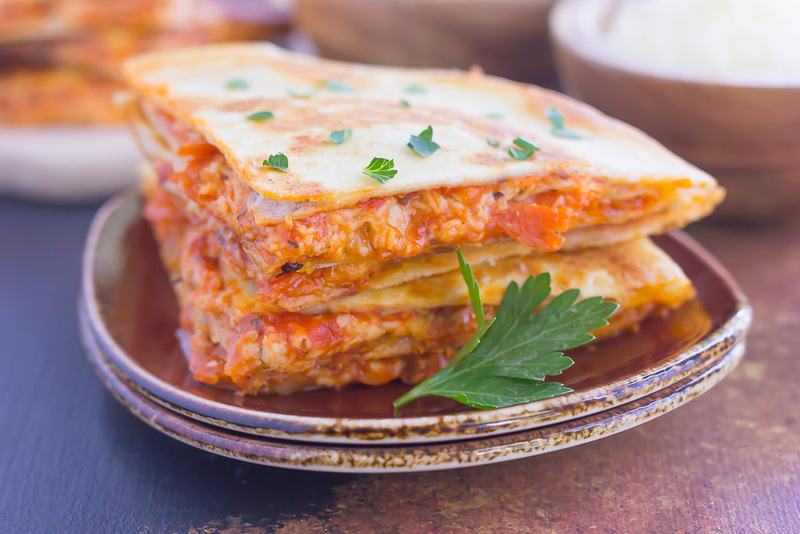 Cheese goes so well on anything, but especially with these pizza quesadillas! Definitely perfect for a Friday night, Arpita! YUM! What a fun recipe! I love it! I make ham, egg and cheese quesadillas on gluten free corn tortillas ALL the time at school! Paired with a side salad, fresh fruit and almond milk... it's such a balanced and satisfying meal! I need to try making a pizza corn quesadilla to mix things up! This looks so good! I love your version of quesadillas, Cailee! I will have to try those out! And I think you will love these, too! haha oh my gosh my sister and I loveddddd the TGIF line-up! We would get sooo excited every week! Man, those shows were awesome! :) And these quesadillas look delicious - so simple too! TGIF TV shows were the best! And thanks so much for the quesadilla love, Ashley! We love making quesadillas for easy meals and I love this pizza version! Hope you are enjoying your weekend! Thanks, Christin! It's so easy to customize these quesadillas depending on your tastes, too. Hope you have a wonderful weekend, too! Fall tv is something that I definitely look forward to, Cindy! I always try to get into one new tv show, too. Thanks so much for the pin and kind words! Oh my gosh, you just brought back some great memories for me! I loved that TGIF line up. Especially Full House and Step by Step. They just don't make tv shows like they used to. In fact, my three children LOVE watching all the Full House re-runs. These quesadillas look fantastic, and so yummy! Great idea!! I agree, Renee! TV is definitely not like it used to be. Full House is such a classic show, I even watch it on re-runs occasionally! :) Thanks so much for the kind words and for stopping by! First of all, I watched all of those shows growing up. Especially Family Matters...oh Steve Urkel...Second of all, you watch American Horror Story?! I am still traumatized from that basement creature thing from the first episode of the first season...and couldn't watch any further (and now I'm scared to be alone in the basement at night!). Thirdly: these quesadillas! Brilliant idea! Love this, such a simple, easy, delicious meal. Ahh Steve Urkel, he was my favorite! I actually haven't seen the first two seasons of American Horror Story (though I have them on DVD). I just started watching last season, and I'm hooked! Thanks so much for the quesadilla love, Denise! Oh yeah! Mexican fusion! I love quick dinners like this. Thanks, Dannii! So easy and so delicious! Just pinned these because I'm going to eat the heck out of them! YUM! Thanks so much for the pin, Pamela! I hope you love these! Weren't those the best tv shows? I'm sad they don't make them like they used to! I can be impatient when it comes to dinner too, Izzy! Especially on Friday nights. I look forward to eating dinner and relaxing, and these quesadillas are perfect for that! 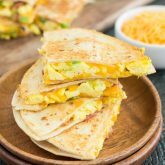 These quesadillas are so easy and versatile, Marcie! I bet your kids will love making and eating these babies! Thanks for the kind words and pin, Chelsea! These quesadillas were delish! Great idea, Gayle! I haven't been having much luck lately with getting nice and crispy pizza bases, so maybe I should give these a go instead! I think you would love these quesadillas, Helen! It's practically fool-proof and so delicious! I LOVED TGIF! I wish they still had that. I'd like to watch those old shows while eating your super EASY pizza quesadillas! Ha ha thanks, Kelly! These are perfect to throw together on a Friday night! I love making quesadillas when we "have no food" in the fridge-- they're so easy and versatile! I love the idea of pizza ones! Aren't quesadillas the best for meals in a pinch? Thanks so much for the pizza love, Jess! Bahaha! I don't remember the theme song for TGIF but I do remember the theme song for Step by Step! I watched each and every single one of those shows religiously! I secretly wanted to be Topenga and I had a serious crush on JTT! Quesadillas are a perfect recipe for a trip down memory lane! Mmm pizza! And cheese! I love the Step by Step theme song! I can still sing it by heart after all these years! :) Thanks so much for the quesadilla love, Lindsey! I agree, Mary Frances! Movies and TV shows are the best way to unwind after a long week. I hope your family loves these quesadillas if you try them! Ohhh boy, now I'm going to be singing that song all day! TGIF was on in our house every Friday night - we loved it! And I loooove these quesadillas. The perfect quick and delicious dinner - my husband is going to love these! TGIF was the best! I hope you love these quesadillas if you try them, Cate! These look so tasty, Gayle! I love pizza quessadillas! This is such a good idea!! Love how easy they are and how cute they look Gayle! I'm a huge fan of pizza (always) and love this easier way of eating them. Thanks, Jessica! These quesadillas are so easy to whip up for a quick meal! Those shows were on every Friday night in my house growing up! Ahhh, those were the days ;) And these quesadillas are a fantastic dinner mashup! I know my kids are going to love them! These are definitely kid-friendly! Thanks, Jocelyn! Is this heaven, or is this a quesadilla? Seriously, this looks almost too good to be true! NEED to try them ASAP! Thanks for the pizza love, Karly!